That decor is straight out of Better Homes and Murder Basements. The folding chair is nice. This place could use a woman's touch. good to know the pools are for swimming purposes! The place even comes with a stove oven.. I have a *great* living situation but I'm ready to move in! A pool for swimming purposes! A small room to run on a treadmill! Full furnished *and* heat?! The real deal maker though are the Christmas lights. 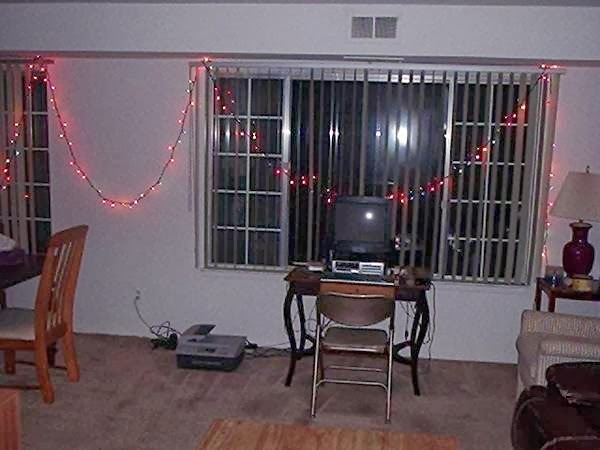 He must be a great guy to hang up such festive lights like that.